Morton’s Neuroma is characterized by pain located in the third interspace. The next most common locations are the second, fourth and first interspaces. A burning sensation is present in the interspace and typically radiates to the adjacent digits. Patients will complain of numbness, a “pins and needles” type of tingling and loss of sensation in the corresponding toes. During certain kinds of over-pronation, a pivoting on the 3rd and 4th metatarsals can cause a shearing force. This shearing force between the 3rd and 4th metatarsals entraps the digital nerve and causes inflammation. The inflammation is what causes the pain. In cases of abnormal subtalar and midtarsal joint pronation, there is excessive transverse plane movement of the metatarsals. Since the 1st, 2nd and 3rd metatarsals articulate with the cuneiforms and act as one functional unit, and the 4th and 5th metatarsals articulate with the cuboid and act as another, there can be significant motion between the 3rd and 4th metatarsals which can cause an irritation to the nerve that runs between them. This inflammation causes the pain. 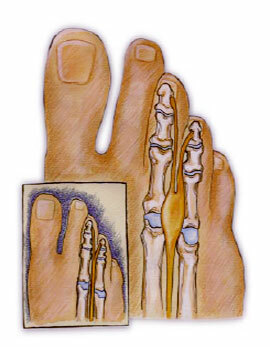 Pain related to Morton`s Neuroma can be momentarily relieved by massaging the affected interspace. Control of the abnormal transverse plane motion of the foot is successful in reducing the symptoms associated with a neuroma. Orthotics should be prescribed, as they will diminish excessive transverse plane rotation between the medial and lateral columns of the foot, reducing pain and inflammation caused by Morton’s neuroma. In instances where the symptoms are non-responsive, a neuroma pad should be added as accommodation to assist in diminishing transverse plane metatarsal movement and compression. Neuromas present in additional interspaces can be successfully treated with functional foot orthotics used to control abnormal foot function in the propulsive phase of gait. Them patient will likely experience some pain relief within weeks and complete recovery within months (generally 2 – 3 months, but may take as long as 12 months).